Is today!! YAYYYY!!! I can't WAIT you guys! I'm not sure if you remember Amy, but she is one hell of a powerhouse and I fell in love with her before I even met her. Her very first email told me that she's all heart and I'm so excited for you to meet her. Though this story does have a lot to do with Amy's weight loss journey, it's not what you think. Let me be clear: it is NOT "Hey gang! I lost 100 lbs and my life changed forever! Follow my weight loss program that I'm selling to you so you can begin living the life you've always wanted to live NOW! Just lose the weight and you'll be HAPPY!" We will not only be talking about Amy's weight loss success, but more importantly, we will be talking about the myths she realized about weight loss while going through her journey. They're important and if you're struggling right now with an obsession to be thin, you have to hear this. You'll also hear all about Amy's son's struggle with his mental health and how this has impacted Amy and her family and what they do to not only make sure that he is living his best life, but that they are all living their best family life together. 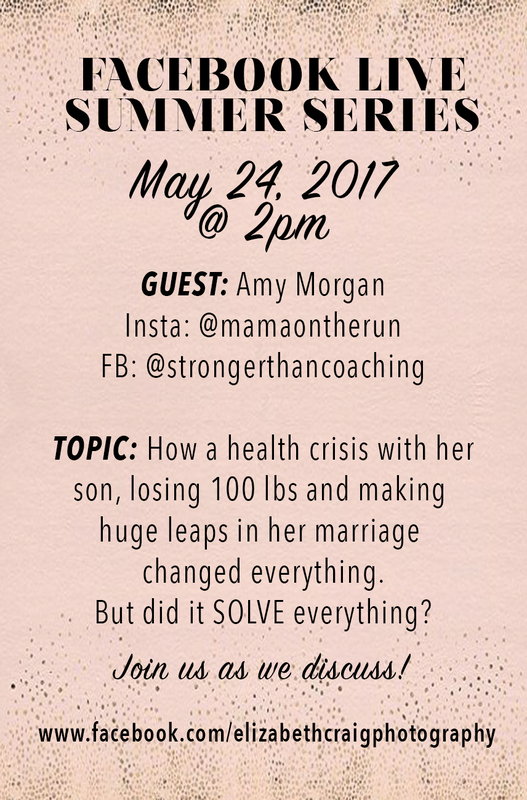 And finally, Amy will also discuss how her weight loss shifted everything in her life and how it even saved her marriage. I haven't even heard this story yet. There is just SO much to jam into this livecast today, so join us at 2pm! As always, if you cannot make it at 2pm, I will make sure to post the video so you can watch it later. Remember, this livecast will be on my PERSONAL Facebook profile page. NOT my PROFESSIONAL page. Make sure to follow this link and be ready to be inspired!